A geologic drama occurring slowly over a period of @ 20 million years is credited for the emergence of cacti. About 60 million years ago in the pre-cacti stage, the regions of Mexico, the American southwest as well as Southern Brazil which are now rich in cactus enjoyed moist, tropical climates. As the mountain pushed up to block the flow of moist air those regions became drier and the plants had to adapt to the changing conditions in order to survive. Gradually leaves became spines useful as protection from predators and as built in sunscreens. Stems fattened into globes, columns and other useful shaped to help retain water. Cacti then became well established in sandy soil, between rocks and other various niches including growing in trees. Since most cacti produce flowers that are loaded down with pollen that is spread from plant to plant by bees and other insects, they have constantly cross bred resulting in thousands of diverse species. So while it is tempting to think of them as primitive plants, the opposite is true. Light: Most cacti and succulents enjoy basking a part of the day in the sun, so they love spending time outdoors in the summer. Place them where they can be sheltered from heavy rains and remember that if you’re moving your plants from inside to outside to slowly acclimate them to the intensity of the sun’s rays because even though they are sun lovers they too can get sunburned. After they do become acclimated most cacti and succulents are happy with no more than 5 hours of direct sun and some as little as 2-3. Just remember that after they become acclimated to the full sun of summer you’ll have to slowly acclimate them to bring them inside in the fall where light levels will be extremely diminished compared to what they have become accustomed to. 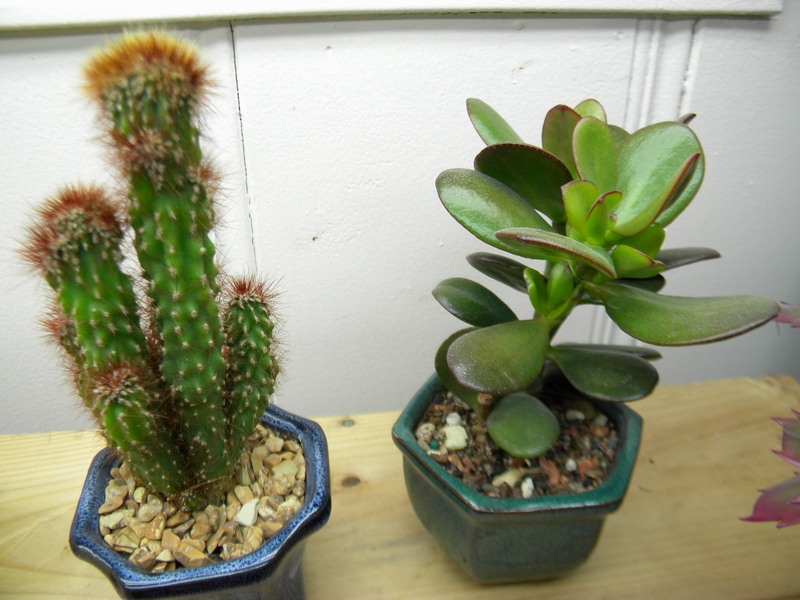 For my personal cacti and succulents I keep them inside under T-5 fluorescent lamps in the 5000 Kelvin range. (2) 4 foot reflectors each with 2 tubes gives me well over 10,000 foot candles of light keeping them very happy. 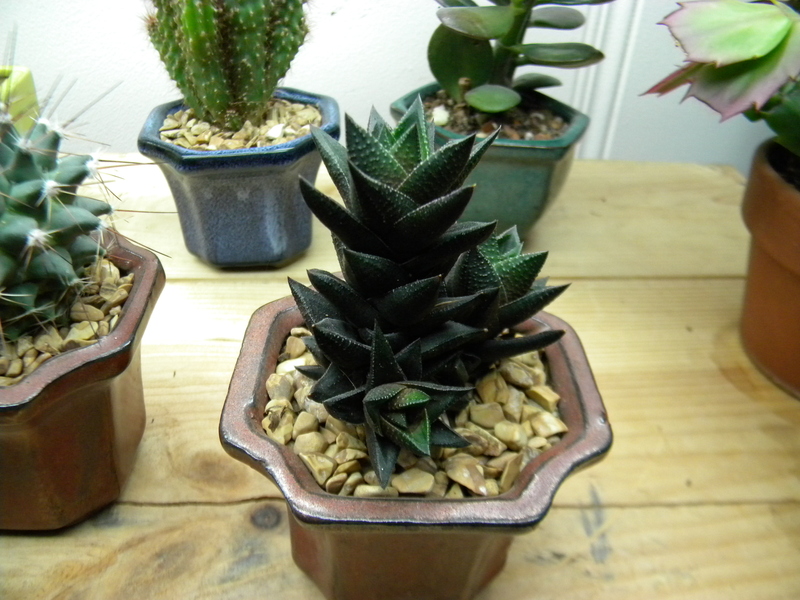 Temperature: In the winter most cacti and succulents prefer a cooler temperature to rest. A room where temps drop to around 55-60 degrees at night is ideal. Some plants need much cooler temps if they are to set flowering buds. I have found that mine do best with day temps in the lower 70’s and night temps in the lower 60’s. Fertilizer: Cacti and succulents grow very slowly for the most part and even the Easter, Thanksgiving and Christmas cactus’s which grow quicker than most other cacti still benefit from a fertilizer that is low in nitrogen Something in 2-7-7 range is ideal. A fertilizer such has Neptunes Fish fertilizer cut at half strength would be ideal. Do keep an eye out for Espoma which is releasing a cacti specific liquid fertilizer scheduled for the spring of 2017. Water: Overwatering cacti/succulents is probably the biggest reason most folks fail at growing them. Especially in the winter when many are at rest. Spritzing the cacti with water from a spray bottle or dribbling small amounts from a cleaned squirt bottle so that a few drops are absorbed around the base of the plant is all that is needed when they are at rest during this time frame. A sign of under-watering is a cacti that is beginning to shrivel up and they will recover quickly once watered. Rehydrate the pots/plants by lightly watering 2-3 times. Cacti are very prone to root rot if the roots are soaking wet. My plants get watered once a week during active growing but I use a homemade soil that is based somewhat on the substrate that I use for my bonsai’s. They do prefer to be in a drier environment with low humidity, but overall dry conditions will entice the dreaded borg to visit your plants and take up shop Yes we’re talking spider mites. A spritzing of your plants every so often helps disrupt their reproductive cycles. Soil: Cacti and succulents need a very fast draining soil and I mean fast. Most folks cut regular potting soil with perlite which I personally hate due to perlite being so light weight and having a tendency to float to the top of a mix when watered. Sharp contractor grade sand is ideal but make sure it is not play or aquarium sand for reptiles which is too fine and will actually clump up holding onto moisture and blocking the needed air space for oxygen to reach the roots. I use Flora Max aquarium substrate that I get from PetSmart. I screen it with my bonsai screen to get what’s needed for my bonsai soil and the stuff that screens through which is coarser than contractor sand, and is more or less uniform in particle size is the perfect substrate for me. I go 80% of this material with 20% earthworm castings and have never had any issues with too much moisture being held resulting in root rot. These are just the basics but cacti and succulents are some of the easiest plants to grow once you master their needs and in my opinion some of the “funnest” to grow as well. They propagate extremely easy giving you many more plants to keep, give to friends or maybe use to start a side business since they are very popular at the moment. Folks are willing to part with some big sums of money for the harder to find varieties, and the number of folks that are on the social media websites/pages that focus on cacti and succulents is mind boggling. So….step into your local garden shop and immerse yourself into this fascinating part of horticulture. You’ll thank yourself, or me, for doing so. Until next month. Have a good one!! !